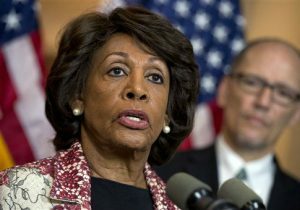 The daughter of Rep. Maxine Waters (D., Calif.) has pulled in more than $600,000 from her mother’s campaigns since 2006 to manage election mailers that endorse politicians who pay the congresswoman for her support, according to a review of campaign finance records. Waters, who has served in Congress since 1991, has utilized the endorsement mailers, known as "slate mailers," to gather hundreds of thousands of dollars for her campaigns from Democratic candidates and causes in California. The operation has proved lucrative for both her campaign and her daughter, Karen Waters. The slate mailers, which are sent to almost 200,000 constituents in the South Central Los Angeles area where Waters holds considerable clout, consist of an "official sample ballot" with brief quotes from Waters about candidates and measures she endorses. In order to receive the endorsement and appear on the mailer, a candidate pays Citizens for Waters, the congresswoman’s federal committee, from their own political committees. Some candidates have paid as much as $45,000 to appear on Waters’ mailers. If a candidate she endorses does not pay her campaign, they must credit their campaigns with an in-kind contribution from Waters. Karen Waters, the congresswoman’s daughter, manages the mailer operation and has taken in hundreds of thousands of dollars over the course of 10 years from campaign funds. Five California judges from the cities of Los Angeles, Long Beach, and Whittier have paid $42,750 for endorsements during the 2016 election cycle, public records show. Karen has pocketed $43,579 from Citizens for Waters this election cycle. She made $174,000 during the 2014 election cycle. In 2012, she received $9,500 while her public relations firm, Progressive Connections, received another $13,500. A number of prominent politicians paid to be on the mailer during the 2010 cycle. Gavin Newsom, the Democratic lieutenant governor of California, paid Citizens for Waters $45,000 for his "share" of slate mailers as he was running for his current office. Kamala Harris, the current Democratic candidate for Senate in California, made two payments totaling $28,000 to appear on the mailer as she was running for attorney general in 2010, records show. Democratic Sen. Barbara Boxer also kicked $5,000 to Citizens for Waters for her endorsement. Progressive Connections hauled in $181,000 that year. In the 2006 and 2008 election cycles, Karen’s firm was paid $237,000. In 2006, Maxine Waters’ son, Edward, also pulled in nearly $14,000 in "fundraising commission." Karen and her firm have received $640,000 total from the Waters campaign to run the mailer operation. Before 2004, Karen operated the slate mailers through a state committee called LA Vote. This changed when the Federal Election Commission issued an advisory opinion stating that Maxine Waters could run the operation from her federal campaign committee. While some of the contributions made from the committees of California politicians to the Waters campaign exceed FEC limits, they are allowable by law. Waters’ congressional office did not comment on the payments.